Pēteris Vasks was born in Aizpute (Latvia) in 1946. He attended the Riga Music Academy and the Lithuanian Music Academy in Vilnius where he studied double-bass with Vitautas Sereika until 1970. From 1973 to 1978 he studied composition with Valentin Utkin at the Latvian Academy of Music in Riga. From 1963 to 1974 Vasks was member of various symphony and chamber orchestras such as the Lithuanian Philharmonic Orchestra (1966-69), the Latvian Philharmonic Chamber Orchestra (1969-70) and the orchestra of the Latvian Radio and Television (1971-74). Vasks has included archaic folkloric elements of Latvian music in his compositions. Most of his works have programmatic titles which refer to natural occurrences. But what really matters to Vasks is not a poetic praise of nature or a landscape description as aesthetic ideal: The mutual relation between nature and man, the beauty of life and the threatening ecological and moral destruction of these values - these are the subjects that Vasks has taken up primarily in his latest works and set to music. In 1996, he was appointed „Main Composer" of the Stockholm Festival of New Music. Three times he received the Great Music Award - the highest prize given by the Latvian state in the field of music: in 1993 for Litene, in 1998 for his Violin Concerto "Distant Light" and in 2000 for his Second Symphony. In 1996, he was awarded the Herder Prize of the Alfred Toepfer Foundation Hamburg. 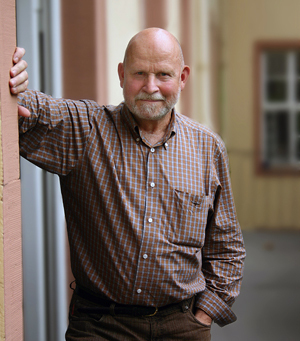 Since 1994, Pēteris Vasks has been an honorary member of the Latvian Academy of Sciences. In 2001, he was offered membership in the Royal Swedish Academy of Music. In 2004, the recording of his Second Symphony and Distant Light (ODE 1005-2) was awarded the Cannes Classical Award in the categories "CD of the Year" and "Best Orchestral Work". Vasks has been Composer in Residence at the Presteigne Festival (2006) and Vale of Glamorgan Festival (2006, 2016), the Usedom Music Festival (2010), the Zurich Chamber Orchestra (2011/12) and the Canberra Music Festival (2012). Pēteris Vasks lives in Riga as a freelance composer.